1) Absolute Boyfriend (Yuu Watase) - This manga is hilarious, its about a girl called Riiko Izawa who without realising orders a 'boyfriend' android and ends up being indebted to the mysterious company 'Kronos Heaven' who claim that she owes them a million Yen for selling her the android (who looks completely human). She also has to cope with the android, who she names Night Tenjo, who frequently removes all his clothes or exhibits superhuman powers in public. 2) Hot Gimmick (Miki Aihara) - This manga is about Hatsumi Narita, a passive sixteen-year-old girl who lives in a company housing complex that is ruled by the tyrannical Mrs. Tachibana, the wife of the company's vice president. How a family behaves in the housing complex can affect an employee's status in the company. When her younger sister Akane thinks she might be pregnant, Hatsumi gets talked into buying her a pregnancy test. Unfortunately, things don't go exactly as planned and Hatsumi is blackmailed by Ryoki Tachibana, the arrogant teenage son of the powerful Tachibana family who bullied her as a kid, into being his slave. 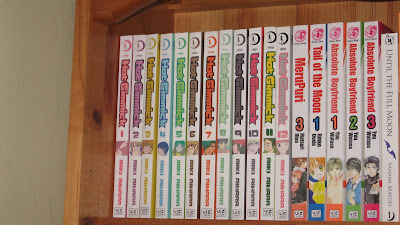 This manga is mainly drama, and as you can see in the picture below I have all the volumes, its gripping!! 3) Tail of the Moon ( Rinko Ueda) - Historical comedy manga set in the tensho era in Japan (1580) about a girl called Usagi (which means rabbit in Japanese) , the granddaughter of a prestigious ninja (funnily enough Ninjas did exist but they were more Assassins) who can't pass her training class because she so clumsy. So her grandfather sends her to marry Lord Hanzo and bear his children but he has no interest in her at all. 4) Meru Puri (Matsuri Hino) - Doesn't have a great story line but the art is really pretty! This manga is about a girl called Airi Hoshina who is catapaulted accidentally into a stunning fairytale kingdom via her grandmother's pocket mirror. She falls in love with Prince Aram, who is in fact about 12 (this manga is quite wrong in many ways), but when he is plunged into darkness becomes an 18 year old; and only goes back to his actual form when he is given a kiss from his true love. By the same mangaka who did Vampire Knight. 5) Paradise Kiss (Ai Yazawa) - Amazing manga, and the anime is fantastic too. About a group of fashion students who approach a shy girl, Yukari, to be their model in their Fashion College's show. Yukari falls in love with the leader of the students, blue-haired and handsome George who is also an incredible haute couture fashion designer. There are also love triangles, lolitas and drama. I really recommend this! 6) Ouran High School Host Club - Comedy manga about a poor girl called Haruhi who wins a scholarship to an elite school, when she gets there she is mistaken for a boy by the School's host club, and they try to sign her up. When she attempts to leave she breaks a priceless vase and therefore is indebted to them and they make her join anyway. If you can't get hold of the manga then watch the anime on youtube, its very funny and the voice acting is great.